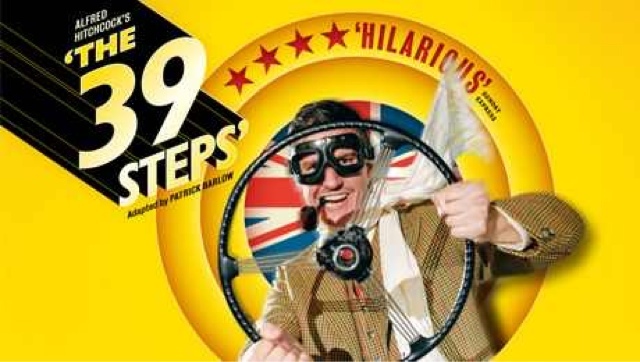 Marking its' 10th anniversary with a UK tour, Patrick Barlow's adaptation of The 39 Steps makes a triumphant and hilarious return to the Theatre Royal this week. With four cast members playing an incredible 130 different roles, The 39 Steps is a theatrical juggernaut with cast members often playing multiple characters on stage in the same scene at the same time. Relying on minimal scenery and costumes, The 39 Steps is accessible theatre at its best and the cast draw the audience into their tale with wit and ease. With the switch of a hat, turn of a coat and revolve of a door the characters change as the plot unfolds deftly in front of the audience's eyes. As the iconic Richard Hannay, leads the cast with charisma and flair as Hannay falls deeper into the dark underworld. Ede wins over the audience with cheeky asides and looks while navigating the increasingly unusual characters Hannay encounters. Andrew Hodges and Rob Witcomb are scene stealing as Man 1 and 2, covering a dizzying array of roles and even portraying bogs with lightning quick character changes in almost a blink of an eye. Each delivers stellar performances with incredible energy and comedic timing. Olivia Greene creates three beguiling, unique characters, each with their own humour and fiery personality. Speaking of fire, hats off to the cast who didn't break their stride when the performance was halted due to a, thankfully false, fire alarm. In a show with such pace and volume of dialogue, it's remarkable to watch the cast pick up exactly where the safety curtain came down without blinking. True professionals. The traditional tartan and shortbread portrayal of Scotland in the piece is always appreciated by a Scottish audience and the steam train sound effects hark back to a golden era of train travel, even more relevant in the week when the Flying Scotsman is back on the rails. Margaret's emotional description of the buzz and life of Glasgow's Sauchiehall Street, expertly delivered by Greene, certainly was a home crowd pleaser. With a superb cast and slick performances, it's easy to see why The 39 Steps continues to pack theatres and impossible to leave without a smile dancing on your lips. The 39 Steps is at the Theatre Royal, Glasgow until 21st May. For tickets and information visit ATG tickets.